"The Octagon Spirit in a new shape..."
The MGB GT - I fell instantly in love with this great british sports car when I first saw it - pictured in a german classic car magazine - and so I had to have one. What a gorgeous shape! The MGB GT combines the attractive lines of the Tourer, designed by Don Hayter, with the supremely elegant Pininfarina roof line, being one of the best looking cars in it's time, and still today. Now I knew it needed a B GT, and after studying everything available about the "B", I found out that a Mk II would be the best choice. After checking various cars, I finally bought my 1969 MGB GT in the early 1990s. 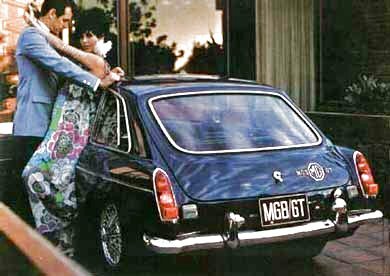 What's about owning an MGB GT? The 1965 sales brochure says it all: "A Grand Touring car, in the spirit of the official definition, is a car with the performance of a sports model, the comfort and ease of a saloon, and the ability to cover hundreds of miles non-stop without fatiguing the driver or passenger. 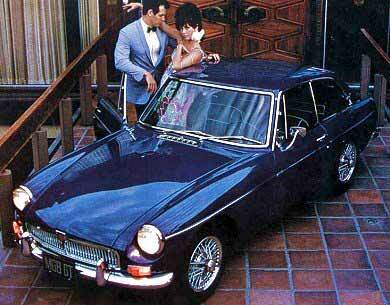 The MGB GT admirably fulfills these qualifications and maintains the style and traditional quality of MG. Personal pride of workmanship, inherent in the name, is manifest in many ways - luxurious fully appointed interior with hand-made english leather bucket seats, careful attention to coachwork assembly and finish, and the many other details of perfection that make a truly great motor car." These words are still true - for the MG enthusiast, that is - but actually the following statement seems to be right now more than ever: "The MGB GT is the lowest-priced true GT Coupe you can own - and, as with all MGs, it will be worth more longer"
"Every inch a thoroughbred - that's the MGB GT"
"The distinctive MG grille, famous around the world"
"A sports car with that much luggage space"
"Leather bucket seats and dash with full instrumentation"